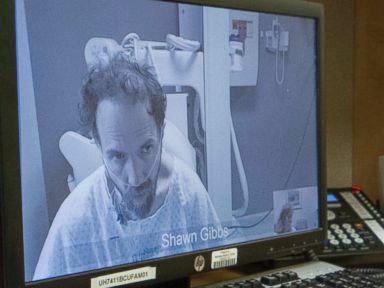 The Ebola outbreak, once thousands of miles away, is now right in America’s backyard with the first transmission on U.S. soil confirmed Sunday in Dallas. The West African Ebola outbreak has sickened 8,399 people since March, killing 4,033 of them, making it the worst Ebola outbreak in history. Find out how the virus first arrived in the United States via U.S. missionaries who were flown here for treatment and then how the virus was imported via Thomas Eric Duncan, who flew from Liberia to Texas with the virus and died in Dallas last week. 1976 – Ebola is first discovered in what is now the Democratic Republic of Congo near the Ebola River in 1976. Thirty-two Ebola outbreaks would follow, bringing the total number of cases before this outbreak to 2,361, including 1,438 deaths, according to the World Health Organization. PHOTO: An ambulance arrives with Ebola victim Dr. Kent Brantly, right, to Emory University Hospital, Saturday, Aug. 2, 2014, in Atlanta. July 27, 2014 – Missionary groups report that two Americans are sickened with Ebola while helping patients in Monrovia, Liberia. 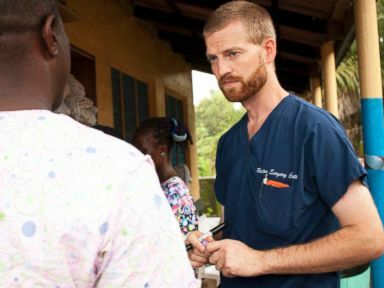 Dr. Kent Brantly, 33, and missionary Nancy Writebol, 59, were working for aid groups Samaritan’s Purse and SIM, respectively. Brantly later told reporters he held patients hands as they were dying. July 31, 2013 – Brantly gets the first dose of an experimental drug called ZMapp, though it was unnamed at the time. Although doctors initially thought there was only enough for one person, Writebol was administered the drug as well. Aug. 2, 2014 – Brantly is flown from Liberia to Emory University Hospital in Atlanta for treatment. He surprises everyone by walking out of the ambulance into the hospital in his protective suit. Aug. 5, 2014 – Writebol flown from Liberia to Emory University Hospital. Aug. 19, 2014 – Writebol quietly discharged from hospital after she tests negative for Ebola. Aug. 21, 2014 – Brantly discharged from Emory in news conference in which he hugs several members of the hospital staff. PHOTO: Dr. Richard Besser walks with Ebola survivor Nancy Writebol and her husband, David. Sept. 3, 2014 – U.S. Dr. Rick Sacra, 51,diagnosed with Ebola even though he was treating patients in the maternity ward of the ELWA Hospital in Monrovia, Liberia, not Ebola patients. Sept. 5, 2014 – Sacra arrives at Nebraska Medical Center for treatment. He eventually gets a blood transfusion from Brantly. 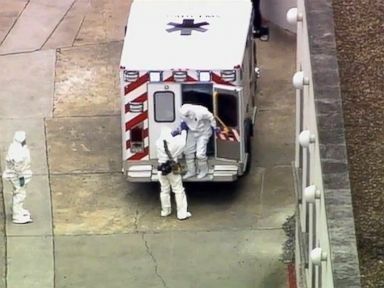 Sept. 9, 2014 – An unnamed American Ebola patient arrives at Emory University Hospital for treatment. This patient had been working for the World Health Organization in Sierra Leone. The patient was still there as of Oct. 13, 2014. PHOTO: In this Sept. 10, 2014 photo released by the Nebraska Medical Center, Debbie Sacra reads Bible verses to her husband Dr. Richard Sacra via a video link in Omaha, Neb. Sept. 20, 2014 –Thomas Eric Duncan, 29, arrives in the United States from Liberia to visit family. Sept. 25, 2014 – Sacra released from Nebraska hospital. Sept. 26, 2014 – Duncan goes to Texas Presbyterian Health Hospital in Dallas with a fever and tells nurse he has been to Liberia. But he is sent home with antibiotics. Sept. 29, 2014 – Duncan becomes the first person to be diagnosed with Ebola on U.S. soil. 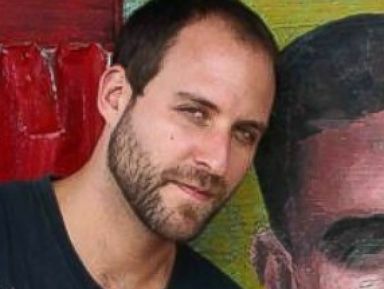 Oct. 2, 2014 – A freelance American cameraman, Ashoka Mukpo, 33, diagnosed with Ebola in Liberia. He worked for Vice News, NBC News and other outlets. Oct. 5, 2014 – Sacra hospitalized in Massachusetts with what doctors at first fear is an Ebola relapse, but soon learn is a respiratory infection. They isolate him out of an abundance of caution. Oct. 6, 2014 – Sacra released from Nebraska Medical Center. Oct. 6, 2014 – Mukpo arrives at Nebraska Medical Center for Ebola treatment. 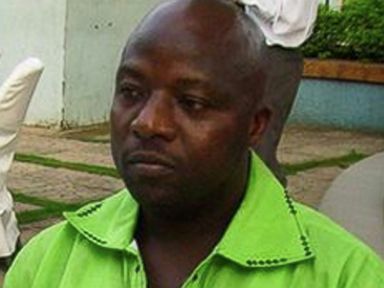 PHOTO: Thomas Eric Duncan, seen here in this 2011 file photo, was the first patient diagnosed with Ebola in the U.S.
Oct. 8, 2014 – Duncan dies. Oct. 9, 2014 – Dallas county Sheriff’s deputy who had signs of Ebola tests negative for the virus. 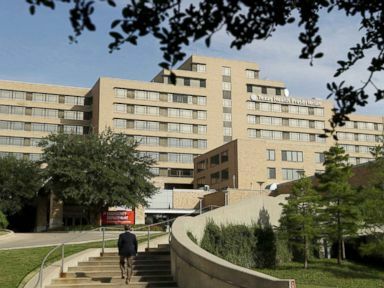 Oct. 12, 2014 – Dallas health worker tests positive for Ebola. PHOTO: This stairway leads to the Texas Health Presbyterian Hospital in Dallas September 30 ,2014. Posted on 14th October 2014 by newsafrica. This entry was posted in Africa, Ebola, Health, Sierra Leone, USA. Bookmark the permalink.